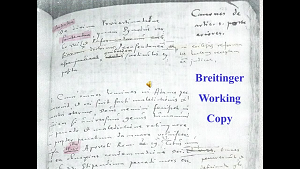 a. to produce a critical edition of all the documents of the Synod of Dordrecht in their original languages (mostly Latin, but some in Dutch, English, German and French) by an international team of institutions and scholars. This critical edition will be published as a multi-volume series, and be made available in digital format as well. The project is to be completed in time for the 400th anniversary of the Synod of Dordrecht in 2018/19. b. to organise conferences, lectures and an exhibition. c. to stimulate research (dissertations, book projects etc.). d. to make the results of the project relevant for a wider audience. Critial edition of the Acts of the Synod of Dordrecht ( 1618-1619). Johannes a Lasco Library, Emden. 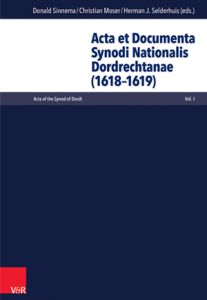 The critical edition of all the documents of the Synod of Dordrecht will be published by Vandenhoeck & Ruprecht. Click here to read more on the critical edition, which will comprise nine volumes. The project is open to Refo500 partners willing to take responsibility for editing one or more parts of the edition. Read here the English flyer. Read here the Dutch flyer. Read here the German flyer. Click on the image below to watch the screencast of Dr. Donald Sinnema’s presentation February 7, 2014.